TEHRAN, IRAN - Iranians on Wednesday were preparing for the annual Nowruz holiday that marks the Persian new year and the arrival of spring. The holiday, dating back to at least 1700 B.C. and incorporating ancient Zoroastrian traditions, is the most important event in the Iranian calendar and is widely celebrated across the territories of the old Persian empire, from the Mideast to Central Asia. 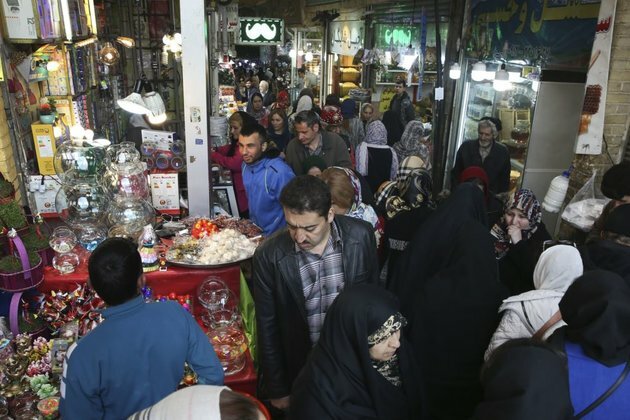 Many Tehran residents were busy shopping and preparing to host family and friends over Nowruz, which will be celebrated Thursday. Street vendors pop up every year in crowded areas, offering lower prices. Iran is facing an economic crisis in the wake the U.S. pullout from the nuclear deal with Tehran and re-imposed sanctions. Iran's currency, the rial, has plummeted, sending prices skyrocketing and wiping out many people's life savings.